Acquiring completed digital exams from various DICOM modalities. Sending these exams to workstations for reading by a radiologist. Storing completed exams in a limited local archive or backup. Recalling prior exams for later comparisons. While most any PACS delivers these, a superior system – like CoActiv – performs at a higher level—quickly, accurately and reliably. 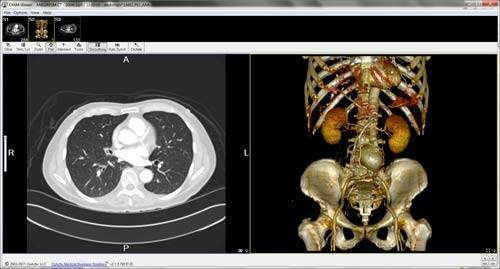 Created with input from working radiologists, CoActiv is truly functional and adaptable for a wide range of radiology applications. Our PACS was designed with exam security, privacy and availability in mind. 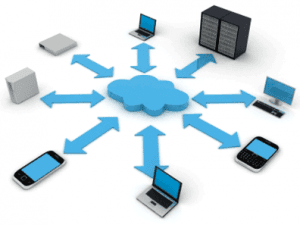 It takes advantage of state-of-the-art architecture for immediate image availability and redundant storage. While other PACS vendors apply various forms of lossy compression to move and store large exams, CoActiv always delivers and locally stores images in full resolution. We do not utilize any proprietary formats, as they may display images at less than full resolution. All DICOM header information is kept completely intact. Any changes in windowing and leveling, annotations, measurements, zoom level, rotation, ROIs and the like are kept in CoActiv’s unique MOD files, which store ancillary information with the original, unmodified images. With multiple MOD files, users can view exams in multiple formats. Additional MOD files can be created for teaching and instructional purposes where HIPAA requires turning off screen annotations. 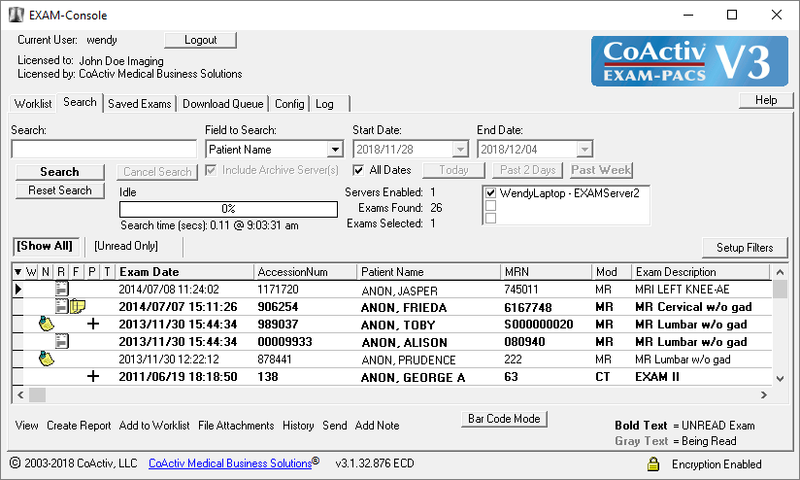 In addition to detailed logs kept of all exam activity, CoActiv also provides instant access to a complete history file associated with every exam. This file includes important information such as where and when the exam was performed, who read the exam, who created any associated MOD files and much more. Another plus is the ability to view exams according to user preferences. CoActiv supports versatile monitor configurations, whether vertical or horizontal, and single or multiple. Easily customizable protocols allow the radiologist to view an image series in the same screen layout consistently, with each exam series in the same location. If desired, layouts can be changed in a single mouse click. CoActiv was designed with exam security, privacy and availability in mind. It takes advantage of state-of the-art architecture for immediate image availability and redundant storage. Created with input from working radiologists, CoActiv is truly functional and adaptable for a wide range of radiology applications. Scalable from a single location to a large multi-site installation, CoActiv is designed with modular components for versatility and flexibility. While offering a full range of premium features, it is simple and affordable to install, configure, use and service. The Diagnostic Workstation, or the radiologist reading station, is the main user interface for the system. Designed for the radiologist, it has full functionality and privileges including the FDA-approved Diagnostic version of the CoActiv viewer which allows an exam to be marked as “Read” and provides integration with various third party dictation systems. The Clinical Workstation, or the viewing station, is the exam viewing interface for non-diagnostic use. The Clinical viewer, for technologists, referring or consulting physicians, has all the tools and functionality needed to assist in clinical decision-making. The Administrative Workstation has the same functionality as the Clinical version, and is intended for administrative personnel to assist in the distribution and pre-fetching of exams as well as scanning related files to the exam. Additionally, CoActiv offers this suite of digital communications products and services designed to optimize the capabilities of teleradiology groups and other radiologists who work in multiple locations. 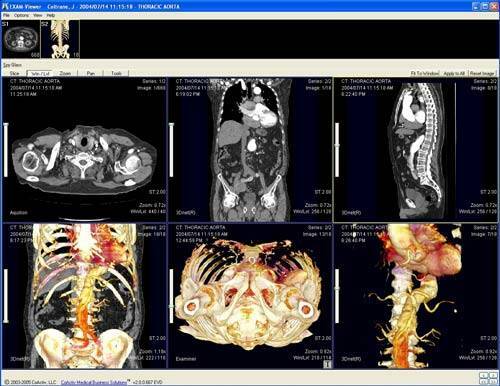 CoActiv enables ultra-fast, anywhere, anytime access to images to provide greater efficiency and fully integrated workflow among all radiology group members, wherever located.